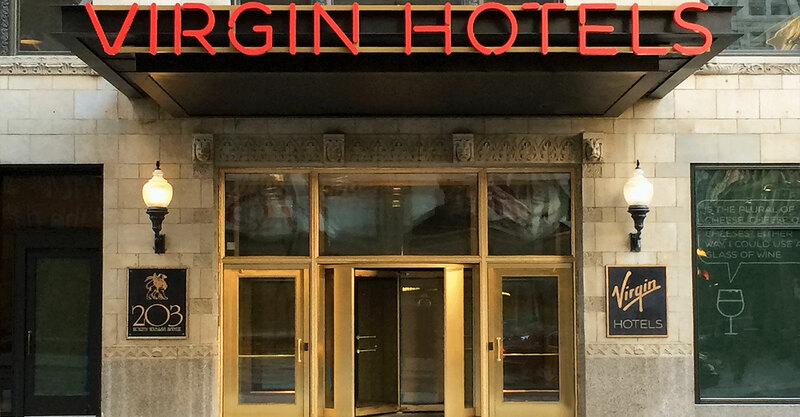 Surround yourself in architectural mastery with a bon vivant, Virgin Hotels Chicago stay. When you think travel innovation and the brands that exude it, you have to think the Virgin brand. Virgin and innovation go together like peanut butter and jelly, and the Virgin Hotels Chicago is no exception. 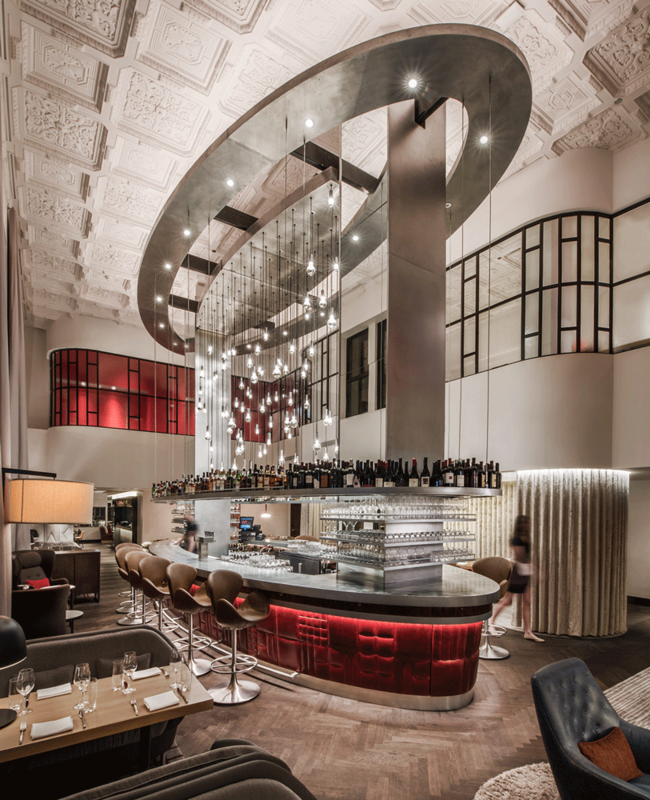 The first of its brand, the Chicago hotel is housed in the old Dearborn Bank building–where history and contemporary cool meld together. Whimsical design touches compliment vintage flair, like the original and decadent ceiling tiles adorning the hotel lobby. Innovation and fun is the name of the game, from trendy bars and rooftop DJs, to a library stocked with Marvel comics and candy. 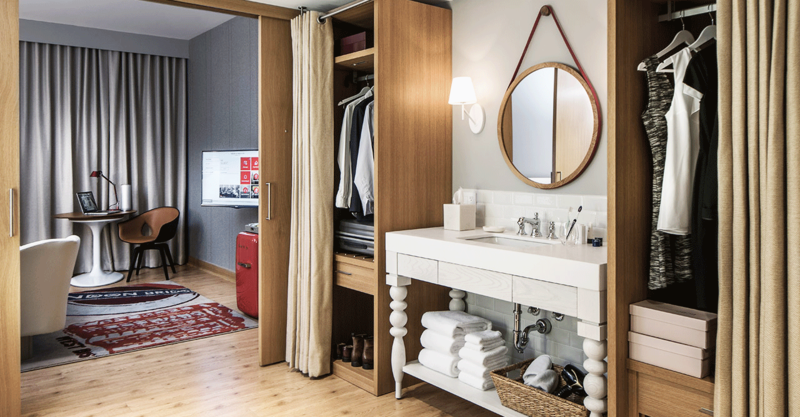 The Chambers (that’s right, chambers) of Virgin Hotels Chicago are thoughtfully creative, without sacrificing comfort. Each is split in half by a set of sliding doors, turning your single guestroom into your own private condo. On one side, your sleeping quarters (because how much cooler and more comfortable are chambers and quarters? ), defined most notably by Virgin’s one-of-a-kind patented lounge beds. The other side houses your dressing room, featuring an airy hallway, smart Poliform closet, and lavish bathroom, complete with rainfall showerhead and shower bench to boot. Bonus points that children under 18 (yes, 18) are permitted with no extra cost, as long as you utilize existing bedding. Virgin's menu of food and beverage options makes the hotels of old look like a mall food court. The world is your oyster (literally, in some cases), with a wide-range of food and drink options for the taking, from a modern all-American diner to cocktail lounge and laid back study on the second floor. It’s the Vegas of hotels. Miss Ricky’s – This modern All-American diner serves classic comfort food with a twist. 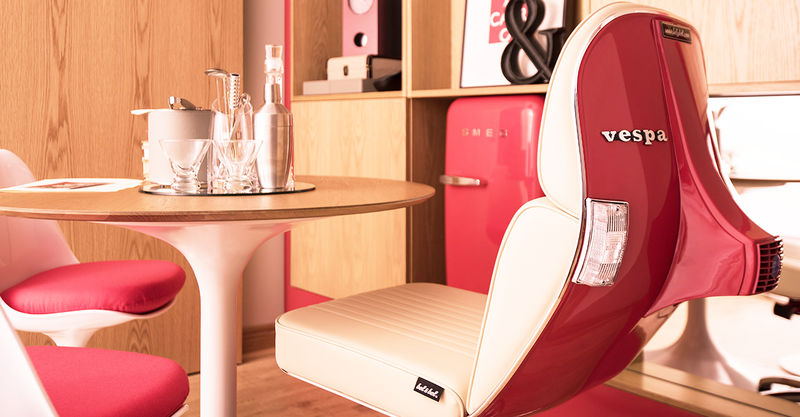 Miss Ricky’s is hip but with a little grunge sprinkled on top to uphold that cheekiness of Virgin Hotel. Plus, breakfast is served all day (late-night pancakes anyone?). Come for your go-to meal but stay for the late-night nosh, like decadent chocolate cake or chilaquiles. Two Zero Three – Located on the ground level, by day this coffee and wine bar invites guests to see and be seen, taking a page out of Europe’s renowned café playbook. At night it transforms into a classy, convivial wine bar. Grab a glass and make some friends. The Commons Club – Eccentric, creative, old-fashioned, The Commons Club welcome’s you. It’s part laid-back study, part lounge, and all part’s delicious cocktails. Need we say more? The Commons Club has a “members-only” mystery to it but without the exclusivity, available to everyone. Explore every varying personality of the bar, from the 1970s-esque den to the nightclub bar to the “Funny Library”. 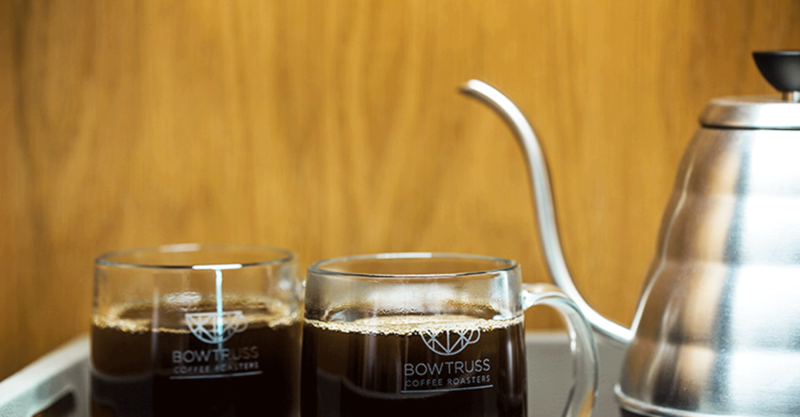 We’d be remiss not to mention Hosted Social Hour from 7-8pm each evening (that means complimentary drinks every day!). 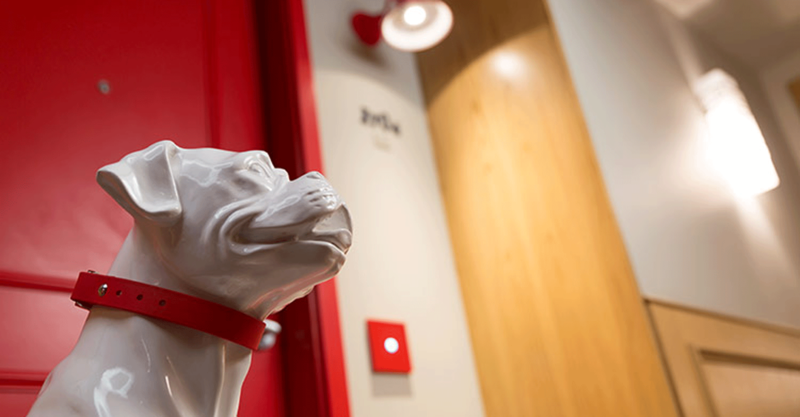 Cerise – As if it could get better, Cerise is arguably the greatest attraction of Virgin Hotel Chicago. Located on the rooftop–with a stunning wraparound deck–this eclectic lounge has a degree in savvy. From the décor to the menu, it’s what you may hope for while taking in the views of the city. Naturally, the colors are vibrant, while style is in no shortage. Upstairs – It only seems appropriate that if any hotel were going to do a modern-day speakeasy, it’d be Virgin Hotels. Find Upstairs, naturally, on the 25th floor, where you can move to the live music inside and then step outside to the terrace to take in Chicago in all its glory. Your night just got a lot more fun. A special room service menu–featuring select dishes from each restaurant–is available delivery-fee free. Thank you, Virgin. If Virgin Hotels Chicago knows style, comfort, food, and drinks, then it should know the art of de-stressing–and does it ever! And in this category, like many of the others, Virgin Hotels Chicago emphasizes community. Idyllic for unwinding, The Spa at Virgin Hotels Chicago boasts a special Eurasian-inspired Hammam, where guests may mingle while they relax. Peaceful solitude, however, is a certainly an option as well. Treatments include body massages, facials, waxing, and nail work. Indulge and de-stress, and while doing so, you may make some new friends. Now that’s what we call de-stressing! To balance those delicious bites and drinks, Virgin Hotels Chicago has you covered with their 25th-floor gym. Open 24 hours a day, the gym features advanced Technogym machines that are even Internet equipped, so you can catch up on work (or Netflix) while sweating it out. But don’t worry if you just can’t pull yourself out of your chambers, since the hotel also provides personal yoga mats. They know what you want before you know you want it. no fees for late check-out or early arrival! Virgin Hotels’ “no nickel and diming” policy extends to its guest room amenities, thanks to free high-speed WIFI and a mini fridge boasting healthy snacks that are sold at street prices (that’s right, no $10 water bottles here). 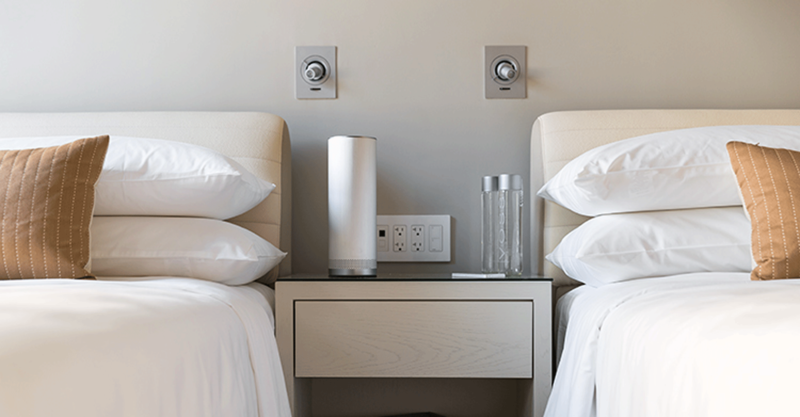 Standard rooms are split into the Chambers and Grand Chambers rooms, all of which come with room amenities that include an HDTV, iPod dock, and workstation with Stellé Bluetooth pillar (if you must). Don your plush bathrobe like a boss and indulge in eco-friendly Palo Santo bath products (using Kind, water-saving efficiency fixtures). The Grand Chamber Suites are what we like to call a decadent treat. In addition to your sleeping and dressing room spaces, savor a dining area, living room, and extra bathroom sink and counter space. Your bedroom also hosts its own sitting area with an inviting, snuggly chair. The real question is, will you ever be able to leave? No specifications or restrictions–just whenever suits you best! Chicago is world famous for its public transportation. Plan your trip here.